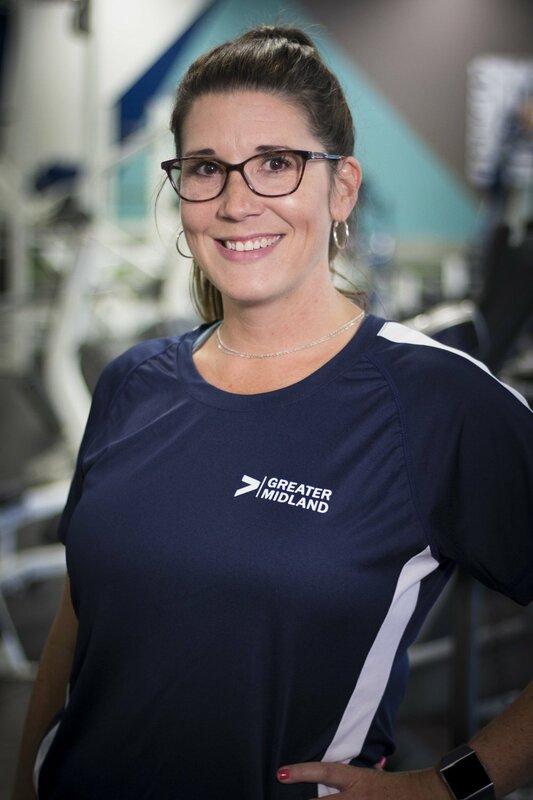 Jill has been involved in personal training for more than 25 years and is now a certified personal trainer at Greater Midland. She attended Michigan State University for her bachelor’s degree in finance and later discovered that her true passion was health and fitness. She then pursued her graduate studies at Wayne State University in exercise physiology. She is currently certified through the National Exercise Trainers Association (NETA). Previous certifications include ACE, NASM and ACLS. Her fitness and health experience also come from working in a cardiology practice, organizing and running a women's strength-training class for Bloomfield Hills Recreation Department, personal training at Lifetime Fitness in Shelby Township and Franklin Racquet Club in Southfield, as well as in-home personal training. Justin graduated in 2008 from Saginaw Valley State University with a bachelor’s degree in health and physical education and a minor in athletic coaching and psychology. In addition to his personal training role with Greater Midland, Justin also teaches elementary physical education for Midland Public Schools. Justin loves working with a wide variety of clients, from anyone who wants to lose weight to competitive athletes. From 2012-2015, Justin went through a weight transformation losing 140 pounds and is eager to help others with their personal journey. He is also a former powerlifter. I was very interested not only in the importance of what you do with your body, but also how to fuel it properly,” he said. As a youngster, Jackson spent much of his childhood playing sports including baseball, basketball, football and, eventually, swimming. At CMU, Jackson’s passion for physical activity blossomed with an interest in triathlons. He also enjoys sports such as kayaking, snowboarding --and hiking the woods for a perfect spot to hang his hammock. Jackson is a certified wellness coach through the National Exercise Trainers Association and a youth fitness specialist with the International Youth Fitness Association. “I enjoy working with all age groups and capabilities to my clients achieve their goals,” he said. Nate graduated from Alma High School and then went on to earn a bachelor’s degree from Central Michigan University in health fitness and preventative rehabilitation. “I am passionate about exercise and the science that is behind it,” Nate said. He was first introduced to weightlifting and fitness when he was 13 years old. Today he is a competitive powerlifter and referee in USA Powerlifting, a former competitor in Strongman events and Olympic weightlifting. He enjoys many aspects of fitness: from losing fat to gaining strength and preparing for a sport. Steve is a graduate of Central Michigan University, where he earned his bachelor’s degree in sports management with an emphasis in outdoor recreation and leadership. Steve earned his personal training certification through the National Strength and Conditioning Association (NSCA). His athletic training philosophy is technique driven by increasing an individual’s proprioception. Strength and velocity can then be increased to successfully meet that client's athletic goals. These principles have led Steve to train many collegiate athletes and record-holding powerlifters. His diet and exercise philosophies are based on lifestyle changes that are obtainable and easily replicable. Those same principles have also been used to simply increase people’s quality of life, including those with conditions such as multiple sclerosis. Steve’s clients include men and women who have lost more than 100 pounds to those competing in bodybuilding, figure and bikini competitions. “Each person is unique and must be treated that way,” Steve said. Steve is an active participant in USA Powerlifting and holds multiple records. Sports and fitness have always been an important part of Mark Herron’s life. Mark played as an all-conference guard for the Wayne State University basketball team which reached the NCAA Division II Final Four during his junior year; he was later named one of the Top 30 players in the university’s history. Mark then spent six years coaching college basketball, including two years at his alma mater, where he earned a master’s degree in sports administration, and two years at Northwood University in Midland. While at Northwood, Mark was responsible for creating and implementing the strength and conditioning program for the men's basketball team. After leaving Northwood, Mark attended Saginaw Valley State University and earned his certification to teach social studies and physical education/health. He worked as a teacher at Farwell High School for a decade, serving as the varsity boys’ basketball coach for the first five years. 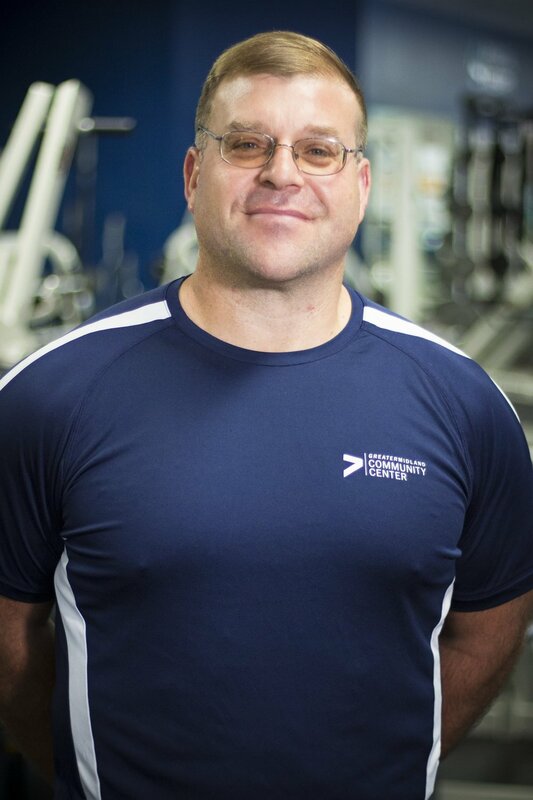 Mark is as a certified personal trainer and group fitness instructor through the National Exercise Trainers Association. “I am passionate about helping people reach their individual fitness and athletic goals,” he said. Sean Leahy earned his bachelor’s degree in exercise science from Western Michigan University. Upon graduation, Sean earned his personal training certification through the National Strength and Conditioning Association (NSCA). Sean is also a level one sports performance coach with Greater Midland. In addition, Sean is also certified as a wellness coach and group exercise instructor through the National Exercise Trainers Association. I’m happy to be giving back to the community where I grew up,” he said. With nearly two decades of experience, Lisa is happy to offer her services as a personal trainer, group exercise instructor and licensed massage therapist. A Caribbean Island graduate of "A" (Advance) Levels College, Lisa studied applied science in anatomy and kinesiology followed by sports massage therapy in Lincoln, Neb. Lisa is a three-time Caribbean national track and field and netball athlete. She has been a member of the National Certification for Therapeutic Massage and Bodywork for over a decade and currently holds her personal training and group exercise certifications through the National Exercise Trainers Association and Aerobics and Fitness Association of America. Lisa enjoys working with people of all fitness levels with particular interest in weight loss and body sculpting. Shelby graduated from Saginaw Valley State University with her bachelor’s degree in exercise science and health science, minoring in athletic coaching and communication. Her health and fitness experience also come from interning with MidMichigan Health’s Medical Weight Management Program, and her work with NICHQ Collaborate for Healthy Weight and childhood obesity. In addition, she is also a certified wellness coach though NETA and an ACE-certified group fitness instructor. Shelby enjoys many sports and participates in a variety of running races, ranging from a 5K to a half-marathon and traveling as far as Florida for running events. Shelby believes making exercise fun and personal are the keys to success in reaching wellness goals. “I’m passionate about helping each client define their ‘why’ -- their reason to be healthy -- and channeling those positive vibes for motivation,” she said. “I love working with a diverse group of people,” Leah Ritter said. A native of Austin, Texas, Leah is a certified personal trainer at Greater Midland as well as a certified group exercise instructor, certified holistic life coach and licensed Zumba instructor. She specializes in functional fitness, believing in making the body strong by using one's body, not just lifting weights and stretching. In her off time, Leah enjoys obstacle course racing with her husband. They have three children. Fitness is Anna Rutkowski’s passion. “I love learning how the body works and how to apply that to exercise and daily activities,” she said. Anna attended Saginaw Valley State University and graduated with a bachelor’s degree in exercise science, with a minor in coaching. Since starting at Greater Midland in 2016, Anna has enjoyed doing personal training, leading group exercise classes, and conducting wellness coaching. She loves working with clients who are at a variety of fitness levels and goals; from moms looking to get back into the gym to clients hoping to lose weight and get greater enjoyment from daily living activities. As a physical education instructor at Midland Public Schools and a certified personal trainer, John Volmering knows a thing or two about staying in shape. John began lifting weights in high school and continued enjoying the sport while playing football at Albion College, where he earned a bachelor’s degree in physical education. He later earned a master’s degree from Saginaw Valley State University. “I enjoy working with clients to set and attain goals, whether it be getting stronger, becoming more active, losing weight, or just becoming a more fit person,” he said. Sean Leahy has his B.S. in Exercise Science from Western Michigan University. Upon graduation, Sean earned his personal trainer certification through the National Strength and Conditioning Association (NSCA). Sean is also a level one sports performance coach with Athletic Republic-Midland. In addition to these certifications, Sean is also certified as a wellness coach and group exercise instructor through the National Exercise Trainers Association. Growing up and playing sports in Midland has driven Sean to seek a bigger role in the fitness industry with Greater Midland, and he is happy to be giving back to the community that he grew up in. With over sixteen years of experience, Lisa offers her services as a Group Exercise Instructor, Personal Trainer and Licensed Massage Therapist. A three time Caribbean national track & field and Netball athlete; speaks English and Patois. An Island graduate of "A" (advance) Levels College where she studied Applied Science in Anatomy and Kinesiology followed by Sports Massage Therapy in Lincoln Nebraska. She has been a member of the NCTMB (National Certification for Therapeutic Massage and Bodywork) for over a decade and currently holds her Group and Personal Training certifications through NETA (National ExerciseTrainers Association) and AFAA (Aerobics and Fitness Association of America). Lisa enjoys working with people of all fitness levels with particular interest in weight loss and body sculpting. Kayla is a Certified Personal Trainer, Group Fitness Instructor and the Fitness Nutrition Coach for Greater Midland. Kayla loves all things food and fitness and one of her greatest passions is learning how to grow and preserve her own foods. She believes everything should be as close to nature as possible and everything in moderation. Not only does Kayla love helping clients reach their weight management and fitness goals but she enjoys being able to provide them nutritional concepts and strategies that can last a lifetime. Kayla believes nutrition isn’t just about being physically fit, it’s about doing everything we can to feel our best every single day. Zach Swarthout is certified as a Personal Trainer through the National Academy of Sports Medicine (NASM). While studying Exercise Science and Psychology at Central Michigan University, Zach started his own business - ZXC Zeekore Personal Training & Fitness Apparel. In addition, he is a Personal Trainer for Greater Midland where he strives to assist his clients with the highest result in both physical and mental health. Personally, besides his NASM certification, Zach is a Central Michigan locally sponsored GNC athlete with experience in competing in the Men's Physique Division of the Drug Free Athletes Coalition (DFAC). He is First Aid, CPR and AED certified through the American Heart Association and has been a fundraiser for a local cancer organization - a cause very important to him.